In this lesson we start our investigation of objects and classes by looking at arrays and how to use them. 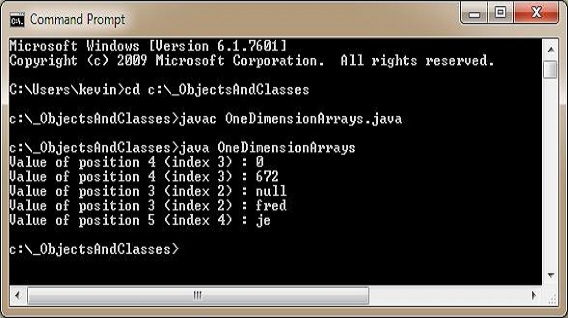 In Java the predefined data type Array objects are used for array manipulation. Investigation of this object will give us an insight into using classes before we start to create our own. An array in Java is an object that contains a collection of values which can be a collection of primitive data types or a collection of reference variable types. An array of primitives data types is a collection of values that constitute the primitive values themselves. An array of reference variable types is actually a collection of pointer values which point to the memory address where each object is stored on The Heap. Whichever variable type the array holds, primitive or reference, the array itself is still an object. 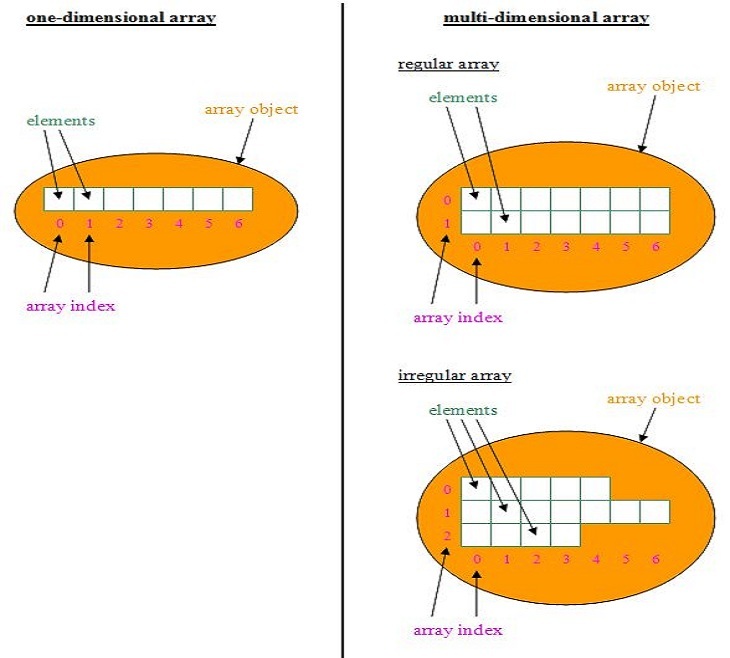 In Java you can define a one dimensional array which is an object that refers to a collection of values repeated one or more times, or multi dimensional arrays which are a collection of array objects (arrays of arrays). Multi dimensional arrays may contain the same number of elements in each row or column and are known as regular arrays or an uneven number of elements in each row or column which are known as irregular arrays. Array creation is a three step process as outlined below and can be achieved using separate statements or combined into a single statement. The following table shows the different forms of the array construct that can be used. strArray1 = new String; Array allocation. Array elements initialized to their default value. The new keyword is mandatory for multiple statement array creation. strArray = "five"; Array element initialization using a loop. Array element initialization using a single element. The size of the array is calculated by the number of values that are assigned to the array and should not be specfied for single statement array creation. strArray2 = new String; Array allocation. strArray = "dd"; Array element initialization using a loop. type arrayName... = new type[size1][size2]...[sizeN] Same rules as one and two dimensional arrays. When declaring an array the square brackets can appear after the type, after the array name or in the case of multi dimensional arrays a combination of both. For multiple statement array creation the new keyword is mandatory. For single statement array creation the size of the array is calculated by the number of values that are assigned to the array and should not be specfied. click the Folder option and call the folder _ObjectsAndClasses and press enter. Save, compile and run the file in directory c:\_ObjectsAndClasses in the usual way. You should see 5 lines of output as in the screenshot above. This is is our first look at the new keyword which tells the compiler to construct a new instance of the object in question. We use the zero-based index number of the array object to access elements within the array. We are printing an element of the array after the allocation step to show default initialization and the same element after we have initialized it. The last line of output displays an element after a single statement array creation step. 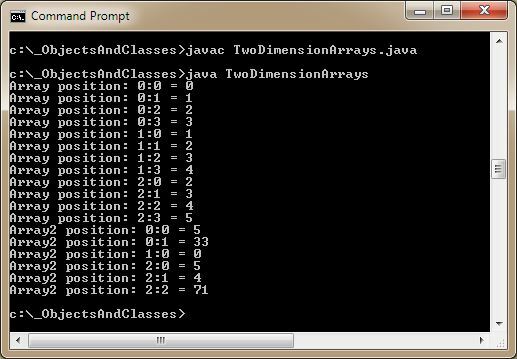 The above screenshot shows the output of a couple of two-dimensional arrays. The first regular array is created using multiple statements and initialized using two for loops; we print the elements as we initialize them. The second irregular array is created using a single statement; we then use a couple of for loops to cycle through the array printing out the element values. We are using the anArray.length code to form the loop iteration. Each array has a length variable associated with it and because arrays are zero-index based this is a perfect way of looping through all the elements of an array. As you can see when we try to run the NegativeArrayCreation class we get a NegativeArraySizeException exception. As you can see when we try to run the OutOfBoundsArray class we get an ArrayOutOfBoundsException exception. As mentioned in the first section Java comes with very rich documentation. The following link will take you to the Oracle online version of documentation for the Java™ Platform, Standard Edition 6 API Specification . Take a look at the documentation for the Array class which you can find by scrolling down the lower left pane and clicking on Array. Take a look through the class so you get a feel for the documentation style and the Array class itself. You will go back to this documentation time and time again so if you haven't done so already I suggest adding this link to your browser's favourites toolbar for fast access. In this lesson we looked at the various types of array for use in Java6. In the next lesson we look at class structure and syntax within our Java programs.